A spokesman for President Recep Tayyip Erdogan said YPG fighters were using US-supplied weapons against troops trying to clear the Afrin region. Turkey says the YPG is an extension of the Kurdistan Workers' Party (PKK), which is fighting for Kurdish autonomy in Turkey, and is a terrorist group. The YPG denies any direct organisational links with the PKK. The militia, which controls much of north-eastern Syria, has been a key US ally in the fight against Islamic State (IS) fighters there. The UN Security Council discussed Turkey's growing offensive in a meeting on Monday, but did not condemn it. Ankara is now demanding an end to the US alliance with the YPG, arguing that the fight against IS is over. 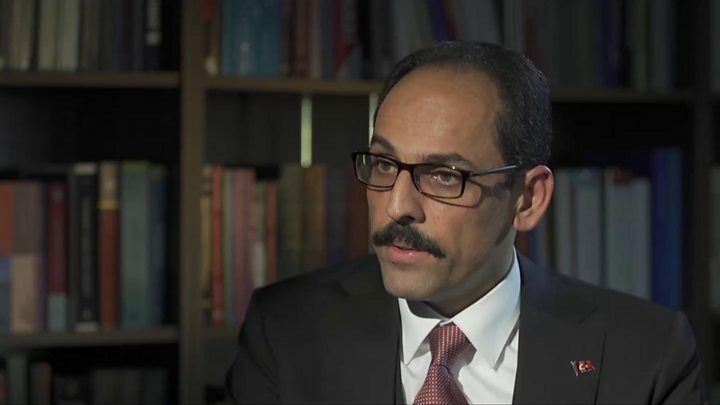 "We cannot tolerate the PKK establishing some kind of a state structure along our border in Syria," warned presidential spokesman Ibrahim Kalin. Thousands of civilians are reportedly trying to flee Afrin, and Syrian activists say more than 70 people have died since the Turkish push began on Saturday. Earlier Turkish President Erdogan had vowed to "sort out" Afrin. "We will take no step back," he said in a live television broadcast. "We spoke about this with our Russian friends; we have an agreement." 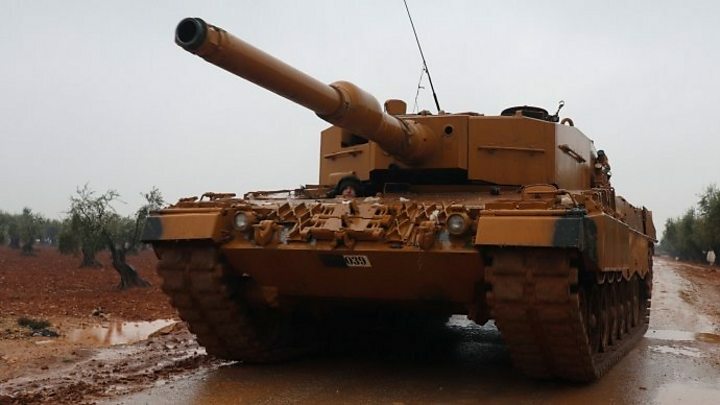 The Syrian Observatory for Human Rights, a UK-based monitoring group, said on Monday that 54 combatants had been killed since Saturday, including 26 Kurdish fighters and 19 pro-Turkish rebels. Twenty-four civilians had also died, it added - 22 in Turkish air and artillery strikes, and two as a result of Kurdish fire. US Secretary of State Rex Tillerson said his country was willing to work with Turkey to address its "legitimate" security concerns in northern Syria. He said the US recognised Turkey's right to defend itself from terrorist elements, and had proposed measures to try to stabilise the situation. France's UN Ambassador François Delattre said Afrin "was of course part of the conversation" at the closed-door talks in New York. "The call for restraint, I believe, was widely shared during the discussion," he added.